Home > Comet Clutches and Parts > Comet 200181A. Self Contained Single Pulley. > Comet 202313A. Comet Industries 350 Series Drive Clutch. 7/8" Bore. > Comet 202312A Centrifugal Clutch. Heavy Duty Self Contained Single Pulley. > Comet 200182A Centrifugal Clutch. A or B Pulley. 3/4" Bore. 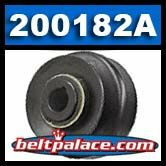 Comet 200182A Centrifugal Clutch: 3/4" Bore v-belt clutch. Comet 200182A Centrifugal Clutch. A or B Pulley. 3/4" Bore. Comet 200182-A. Comet 350 Series Centrifugal Clutch with 3/4" Bore v-belt clutch 200182A for 1/2" (A) or 5/8" (B) V-Belts. Replaces: Maxtorqe 3391104 (Rotary), carter bros, Stens 255-075. COMET INDUSTRIES PULLEY CLUTCH NP35AB 75 CLUTCH S350. Genuine Comet Industries centrifugal clutch. "Comet 350 Series clutches lead the pack in durability, rugged construction, and design. Ratings for all parts are higher than requirements for normal service." Comet 200181A. Self Contained Single Pulley. Comet 200181A. Self Contained Single Pulley. 5/8" Bore, 3/16" Keyway. 3-1/2" Overall Diameter, 3" Diameter Pulley attached. Comet 202313A. Comet Industries 350 Series Drive Clutch. 7/8" Bore. Comet 202313A. Comet Industries 350 Series Drive Clutch. 7/8" Bore. Comet/American Sportworks-ASW/MANCO Part 202313-A. Shriner/Model T Replica car drive clutch. A28 V-Belt (Raw Edge). 1/2" Wide, 30� Length OC (762mm). Replaces Standard Raw edge A28 belt, 4L300 FHP V-Belts. B31 POWER ACE V-BELTS: B Section. 34" x 21/32"
B31 POWER ACE V-BELTS: B Section. 34" L x 21/32"
B32 POWER ACE V-BELTS: B Section. 35" x 21/32"
B32 POWER ACE V-BELTS: B Section. 35" L OC x 21/32" W. Replaces 5L350, Dayton 6A153 FHP Belts.